Mount Abu: In 2016, India stood 130th among 190 countries in the World Bank's 'ease of doing business' ranking. A year later, having implemented a slew of reforms, India climbed to the 100th position. This year, 2018, the country moved up to the 77th position, ranking among the top 10 reformers, a list led by New Zealand, Singapore and Denmark. Has this changed things substantially on the ground? This is the question researchers and policy analysts are asking. In Delhi, one of the only two cities (Mumbai being the other) in India that the World Bank considers for the ranking, recent business reforms have not been beneficial for small entrepreneurs, a new 'Doing Business in Delhi' study by the Centre for Civil Society has found. Consider an eatery: In Delhi, an entrepreneur needs at least eight licenses to start a non-alcohol serving eatery, 11 if they want to serve alcohol and 13 if they play recorded music and choose to install a lift. By contrast, it takes four licenses to open and run a restaurant in China and two in Turkey. One of those licenses is the Eating House License, a document issued by the Delhi Police. Despite taking the process online, there are long queues in front of the Eating House desk of the Licensing Unit of Delhi Police, the study observes. One respondent said, "Bribery is widely regarded as a legitimate way to obtain the Eating House License," while another remarked, "The licence is delivered at your doorstep if you know the right price to pay." Making it easier to do business is vital to promote entrepreneurship and employment. About 18.6 million Indians were unemployed in 2018--3.5% of the workforce--according to the International Labour Organization. At 16%, unemployment among the youth and those with higher education is the highest in the country in the last 20 years, according to the State of Working India 2018, a report by the Centre for Sustainable Employment of Azim Premji University. "[T]he steps taken to ease doing business are largely window-dressing, merely ticking off boxes on a reform checklist," said Alston D'Souza, a co-author of the study, in an interview to IndiaSpend. "Delhi government must rethink and rewrite the rules of the game to improve conditions for micro, small and medium enterprises, such that licensing requirements are rationalised, procedures streamlined, the processing of permit clearances is made faster and less expensive, and transparency is improved," he said. D'Souza was part of the India Fellow Social Leadership Program, which trains young people in development management, at Prayog in Bihar. He completed his undergraduate studies in engineering from the National Institute of Technology, Karnataka, and is now a senior research associate at the Centre for Civil Society. India's ease of doing business ranking has jumped from the 130th position in 2016 to the 77th in 2018. You feel that this improvement does not reflect the business scenario faced by the average micro, small and medium enterprise (MSME) across India. Why? Firstly, the World Bank ranking is based on the conditions prevailing in Mumbai and Delhi only, so in that sense, the index covers a niche; it ignores India outside of those two megacities. Within those cities, too, the assumptions that the index is based on [to enable a comparison of business regulations across the 190 participating economies] narrow the focus to larger, typically manufacturing enterprises with access to expert assistance. For example, a 'business' under the 'starting a business' aspect is defined as one with office space of approximately 929 sq m (10,000 sq ft); which is 100% domestically owned by five people; which has a start-up capital 10 times the per capita income and a turnover at least 100 times the per capita income; and which has 10-50 employees within one month of starting operation. Many MSMEs in Delhi and Mumbai do not meet these criteria and hence, their experience is not considered for the index. Second, if you look at the reasons for India's improved ranking, the rise in 2017 is largely attributed to reforms such as the extension of the validity of industrial licenses and the enactment of the Goods and Services Tax (GST) and the Insolvency and Bankruptcy Code (IBC). The rise in 2018 is attributed to reforms in obtaining construction permits, trading across borders, streamlining procedures, reducing the time for processing permit applications and improving transparency at the state level. Aspects such as industrial licenses, construction permits and export norms are of no relevance to most MSMEs. To boost the ease of doing business across states, in April 2017, the Department of Industrial Policy and Promotion (DIPP) of the Ministry of Commerce and Industry, in partnership with the World Bank, introduced the Business Reforms Action Plan (BRAP), a set of 405 recommendations covering reforms on labour, contracts, property registration, construction, environment, and so on. States' progress on the action items prioritised in the preceding year is assessed based on self-declaration. What was your finding for Delhi? In Delhi, reengineering of business process has been a window-dressing exercise. To increase transparency in and accountability of environment- and labour-related inspections, state departments were meant to publish standard operating procedures, deploy risk assessment algorithms, randomise the allocation of inspectors, and make inspection reports/findings available to enterprises. Many of these steps have been ignored. Another DIPP recommendation, to set up specialised commercial courts to focus exclusively on commercial disputes and to fill 90% of the vacant judges' posts, has only been addressed in name. 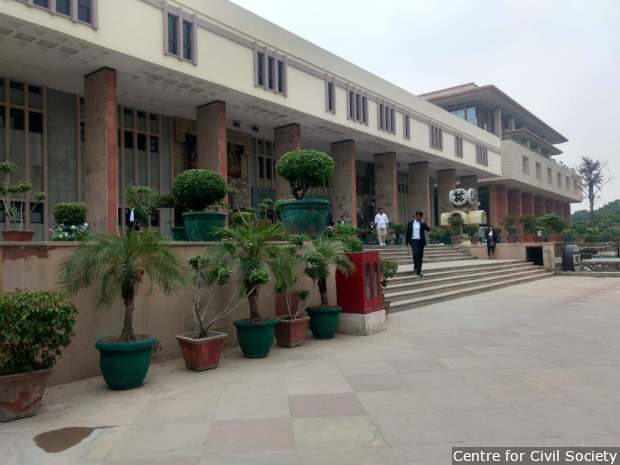 The Delhi government has created a commercial division at the High Court of Delhi. However, despite being established to deal exclusively with commercial disputes, the total time spent by that court on non-commercial disputes was 2.73 times the time spent on commercial disputes. The time spent on commercial disputes was not proportional to the number of pending commercial cases nor was the time available with judges assigned proportionally between commercial and non-commercial cases. The capacity of the court to hear commercial cases remains the same since no new judges have been recruited. Implementing the DIPP recommendation in the right spirit would have meant creating two sets of judges, one commercial and one non-commercial, or at least instituting measures to ensure the resources of the court were shared rationally. In 2018, we understood that the BRAP assessment would consist of business-to-government feedback as well. We don't know if that survey has been conducted. There is a general lack of transparency surrounding the assessment. You surveyed several industries including the retail food business, slaughter houses and small meat shops, and e-waste handlers, to name a few, to determine how easy (or difficult) it is to conduct a business in practice. Based on your survey of the e-waste industry of Delhi, what are your conclusions about how red tape adversely impacts business? Since the disposal of e-waste impacts the environment, does this business harm Delhi residents? The National Capital Region has 28 authorised (licensed) recycling firms with a capacity of processing 107,976 metric tonnes annually, considerably more than the 85,000 metric tonnes of e-waste generated annually. Theoretically, these authorised recyclers should be utilising 79% of their combined capacity. However, six authorised recycling firms in Faridabad, Rohtak, Manesar and Hapur were operating at 39.9% of their capacity when we surveyed them. We found that some authorised recyclers were diverting their e-waste to unauthorised recyclers instead of recycling within their facility, because doing so fetches them a higher return. Informal recyclers can offer e-waste sellers up to twice the amount offered by authorised sellers because they incur lower operational costs by avoiding environmental and labour compliance. For instance, they circumvent rules mandating that the toxic components of e-waste such as mercury and lead be treated before being disposed. Unauthorised recyclers simply dump this waste in the open where it contaminates the soil and pollutes water bodies. Our visit to Seelampur actually showed collusion between unauthorised and authorised handlers of e-waste. We posed as potential consumers looking to sell e-waste and asked if we could have some legitimate proof of our transaction. The informal recycler offered us a certificate that verified his status as an authorised recycler and a Goods and Services Tax transaction ID validating our sale. He rented these documents from authorised recyclers for a fee. If we were to insist on documents verifying our transaction, he would accommodate this fee in the e-waste prices he would charge us. If government checks on the industry were effective, unauthorised recyclers would not be handling the bulk of the e-waste generated in India. As in other avenues of business, the existing licensing process for e-waste handlers is way too slow. In the official version, the average time taken to obtain Consent to Establish and Consent to Operate from the Haryana and Uttar Pradesh State Pollution Control Boards for recycling e-waste is 1.3 months. We found it actually takes up to 24 months. A good business would show concern for its employees, especially workers who occupy the lowest socioeconomic strata. The World Bank takes cognisance of this, in tracking key labour market regulation indicators on the doing business website even though the report does not consider those indicators for each countries' aggregate ease of doing business score or ranking. What were your findings on the welfare of labour in Delhi? The labour department of the Government of NCT Delhi claims to have adopted two reforms proposed by the DIPP--checklists and standard operating procedures (SOPs) for inspections under seven key labour acts covering various aspects of hiring and compensating workers and their conditions of work (Payment of Bonus Act, 1965; Delhi Shops and Establishment Act, 1954; Equal Remuneration Act, 1976; Payment of Wages, 1936; Payment of Gratuity Act, 1972; Contract Labour Act, 1970; and Minimum Wages Act, 1938). We assumed that following processes aimed at speeding up resolution of complaints was a major step towards ensuring worker welfare, and so investigated whether these processes were being followed by the New Delhi District Labour Office. Of the 846 labour complaints we analysed, 33.6% inspections were carried out later than the SOP-mandated deadline of 15 days. More than half of the complaints we analysed (54.8%) remained unsettled for an average of 311.5 days, or almost a year. Department officials cited manpower shortages as the key reason for the high pendency, claiming they dealt with approximately 60 to 80 cases per month. However, we concluded that low levels of awareness among inspectors of labour law provisions and what constitutes a violation was partly to blame. For example, inspectors said discrimination during promotion does not constitute a violation under the Equal Remuneration Act 1976, which is incorrect. Moreover, the additional labour commissioner claimed that the Act was redundant as there were no complaints under it in the last 25 years. Their own website contradicts the claim by showing that 2,826 inspections were conducted under the Act in 2002 alone. While 83% of the sanctioned inspector positions remain unfilled, we concluded that the department is not overburdened because the complaint register shows that an inspector receives 25.9 complaints a month, which implies approximately one complaint per day.